Reflections on Innovation, Part 1: Who Rules the Space? "But I didn't put my hand up." It was something akin to the above that participants in the Learning and Development Centre's (LDC) Social Sciences' Teaching and Learning Showcase, 'Reflecting on Innovative Practice', arrived to: a familiar environment broken up by a suspended, mobile-like story and a set of stimuli laid out to prompt reflection. This sequence of three blog posts, written by the team working on the IATL-funded project 'The Warwick Handbook of Innovative Teaching', will reflect upon that environment, the questions that have arisen from this and other LDC showcases, and how the handbook will seek to address them. Details of the talks from the day, which addressed both nascent and established innovative practice at Warwick, can be found on the LDC website. S0.19 is a standard small, tiered lecture theatre. It has a whiteboard, computer and projection technology at the front, its walls adorned with ‘no food', ‘no smoking', and ‘lecture capture' signs, and the rows of desks perfectly fulfil their dual purpose of aiding note-taking and creating a buffer between student and lecturer. The desks are also slanted towards the student, presumably in an attempt to dissuade them from bringing in banned food and drink by forcing them to hold their paper or laptop in place in order to take notes (thus leaving no free hand to do the same with contraband). For this event, however, in the spirit of innovation, we decided we would attempt to disrupt the all-too-familiar space. Alongside the aforementioned mobile and desks covered in stimuli (Blu-Tacked down to avoid sliding), we created a distinct path through the room with waist-high masking tape in an attempt to shepherd participants past the material before they could find the safety of their seats. My fellow organisers and I had thought to ourselves: “now the group will have to acknowledge the pedagogically-relevant material that lies around them; they won't be able to take their seat without engaging with it and will be invited to see a familiar space afresh.” Little did we know that the layout of the room and building were tougher opponents than we had thought. Having an event in the Social Sciences building pretty much necessitates breaking the rules and bringing food into the room unless you want to block a busy corridor bustling with students. As such, participants grabbed some food and hurried into the room. However, because they were awkwardly balancing an enticing and full plate alongside bags and coats many of them quickly ducked under the tape to find a seat. Gone was the illusion of a pathway and new space; remaining was S0.19 with some inconvenient bits of tape and paper in odd places. Perhaps more people would have gone back to read the stimuli had the slanted desks not required them to remain seated to stop their food from ending up on the floor and the tape not now made the return journey look arduous. Irony abounded. We attempted to subvert the traditional rules of the space and create others to facilitate a different style of interaction and prompt innovative thought only to be thwarted by the very things that were supposed to aid focussed learning in the first place: slanted desks and guiding tape. Worst of all, I, frustrated, chastised the group (hopefully without too harsh a tone) for ignoring the pieces and new dynamic that we had set up. As if I had a right to admonish their ignoring our new rules when we had been so cavalier with the old space's rules or as if the participants' breaking the ‘taped' rules was somehow worse than the organisers ignoring the rules of the space as it originally was – particularly the ‘no food' rule. Indeed, it was the latter misdemeanour rather than the former that proved more central to our downfall. However, all of this is fertile ground for reflection, both practical and theoretical. What strikes me as I re-read what I have written is the word "shepherd". Although we felt we were guiding people in an interesting and stimulating direction and inviting them to engage freely, what we actually ended up doing was attempting to control the room and the participants in quite a heavy-handed fashion. Some control may well be needed in teaching contexts - an anarchic classroom is not very often a place of learning - but in this instance we perhaps retained too much control and, like the desks, attempted to force engagement and learning where should have, instead, invited it. We will undoubtedly try disrupting regular spaces again, whether that be another lecture theatre or the pages of a certain teaching handbook, as disruption often least to stimulation, but it will be with the notion of striking a balance between controlling, guiding, and inviting firmly in mind. It should also be mentioned that, despite this small failure, some attendees did thoroughly engage with the room as we'd prepared it and the event as a whole was a success in stimulating ideas in our audience. It was noted on the day that the two undergraduate reasearchers, Dominic Nah and Laura Primiceri, were the real stars of the show and offered some pertinent and insightful comments on the univeristy's teaching practice (innovative or otherwise). In parts two and three of this blog series they will be presenting their thoughts on the event and other questions. They are posts you certainly don't want to miss! At the event this consisted of reflections from Ersébet Strausz on her pedagogical experiences. 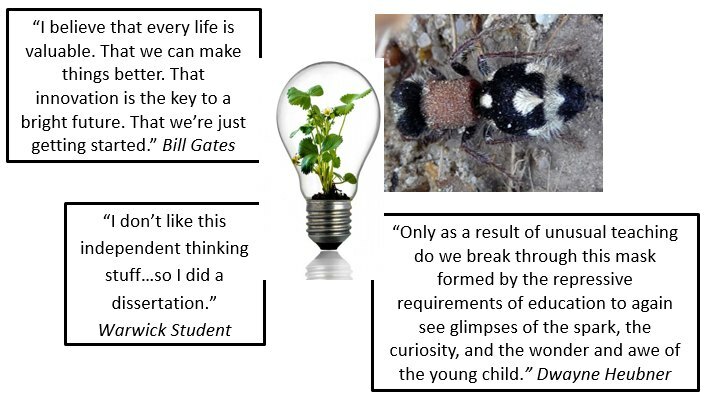 The above, however, are a few ideas, quotations and images that inspired the innovative handbook project.